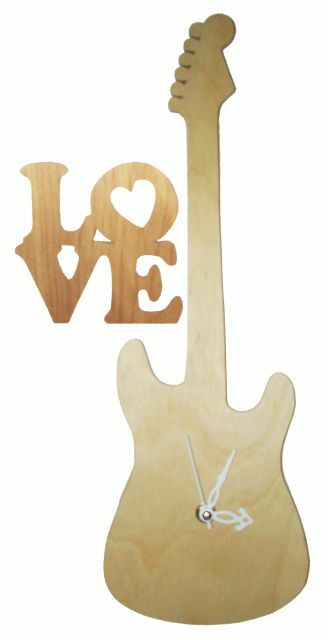 ***Update*** Mid January and this project had suddenly become very popular, not as a clock, but simply as a guitar. Some of the students have gone as far as to paint them and mount strings on them. 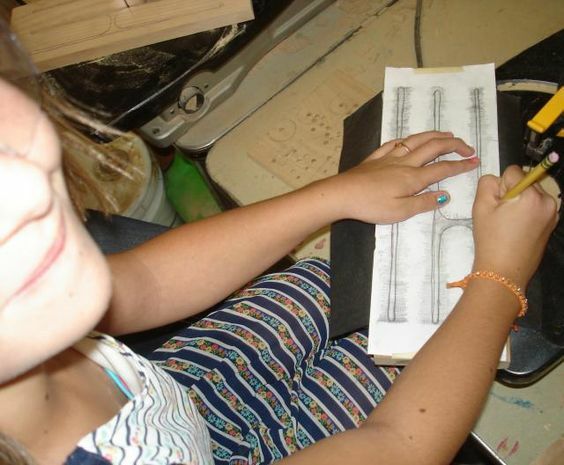 ***UPDATE*** 9-9-15 This 4th grader is the best natural scroll saw cutter I've ever seen. He easily can out cut an 8th grader and it's the first time he's used the machine. He has little sanding to do because of how well he made the cuts. Cutting out the love pattern. ***UPDATE*** 9-14-17 This is one of the more popular projects and this example below is one of the more elaborate ones made by a new 7th grade girl in our class. 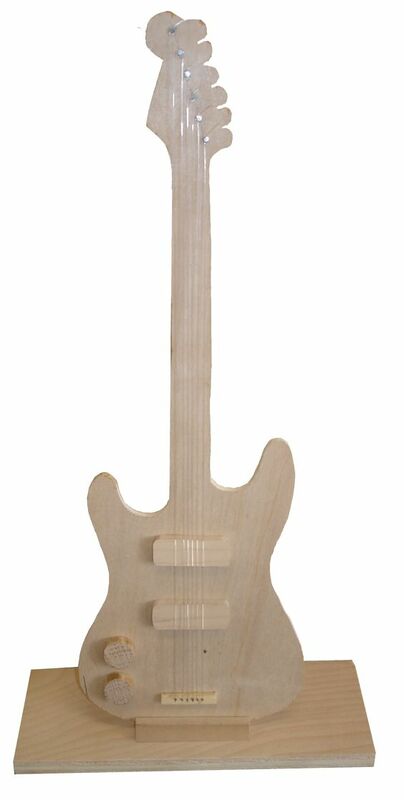 Sporting 6 strings and including a removable stand, the new to our school student has really taken to wood shop. 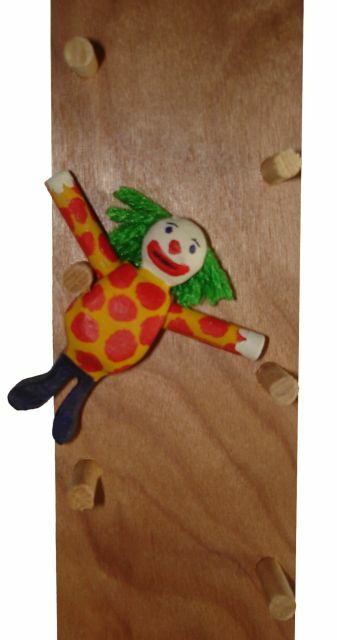 Today I put my own twist on Steve Good's Clown Drop Toy. Watch the Video and download the Plan. I've found that when I print off these plans, they tend to shrink down from the original size, so you can either make it to the printed pattern size, or recalculate everything like I did to bring it back to proper scale. Also, the angles are not given in degrees, just drawn out on the pattern. By experimenting, I found a 15 degree blade tilt when I run the groove in the base, gives the back (which I made from 1/4" panel) just the right angle keeping the clown inside the pegs and almost always standing when it gets to the bottom. Instead of a built up base as shown in the plan, I used a 3/4" x 2 1/2" x 6" piece of MDF as the base, but it could just as easily been made from 1/2" material. 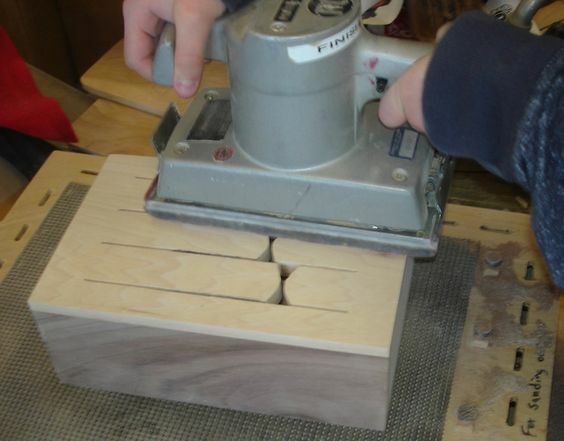 This keeps it simple and allows me to continue using cabinet shop scraps. I found that after I painted it with non-toxic acrylic, the painted surface created a little more friction and the extra drag made it not work correctly. I fixed the problem with a coat of finish making the back look dark. I would rather not finish a toy that kids are going to play with, so I will recommend that the students don't paint under the arm pits or the back side of the clown to keep them working smooth enough without taking away from the appearance or having to use finish on a toy. The green hair is made from yarn that is glued with PVA neutral Ph non-toxic acrylic glue. The project has turned out to be more popular than I expected. I have been trying to steer the students away from the more difficult projects until they have more experience. This 8th grader has completed the ladder part of the project and is now making a template for tracing and cutting the clown, something I didn't get around to during the summer. 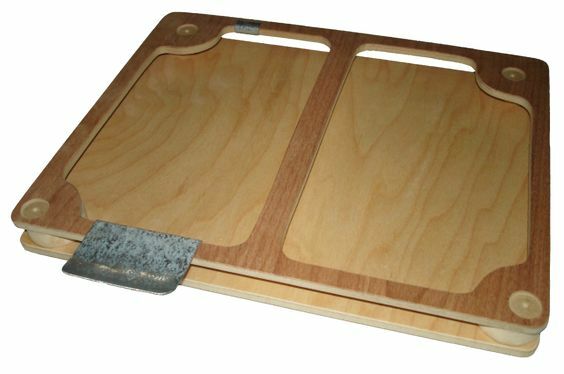 This way they are getting a chance to gain a more advanced experience by making their own template from scratch. 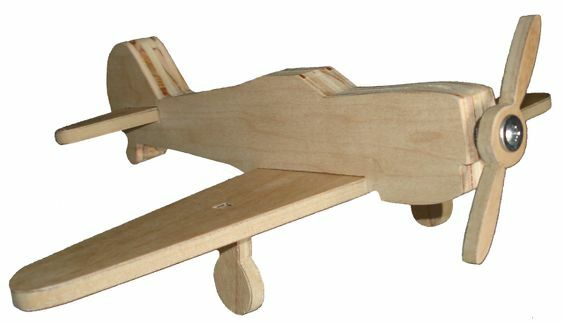 This morning I made a simplified version of Steve Good's fighter plane (download the plan). Both of my son-in-laws are civilian pilots and this was a fun build. I purposely streamlined it and left off some of the other details to keep it easy enough for the younger students as well as to keep it looking a little less military. It takes a little bit of 3/4" scrap and some 1/4" scrap, all sheet materials. If we make the propeller out of solid material, then shape it so it will spin in the wind, it can become another whirligig. 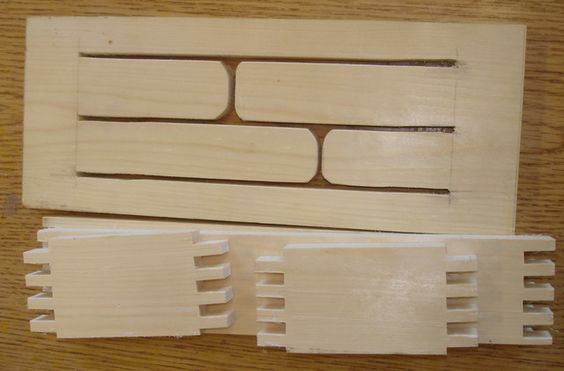 As with the other prototypes, this sample has not been glued so I can show the students how it is put together. The wings have been screwed from underneath. If the fuselage gets made from solid stock, it can then be tapered toward the rear to further enhance the realism like on Steve's plan. I was reminded by one of our teachers that we start back in about three weeks. Students start back the first week of August. ***UPDATE*** We begin making the airplane by tracing templates. After cutting and sanding, this airplane has the front wing screwed into place and the rear wing has just been glued and is being pushed into position. Cutting the Hello. This first one was abandoned and a second one started. Cutting straight is proving to be harder than it looks. Sanding the Hello. 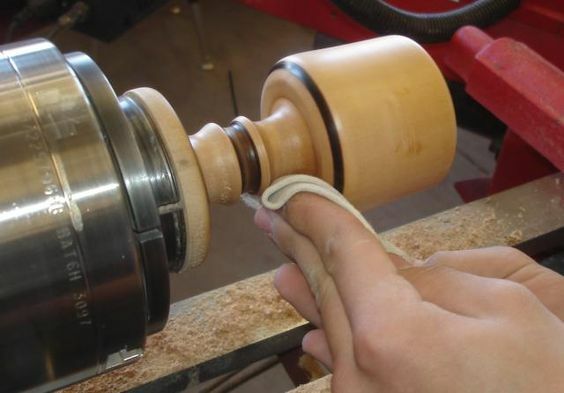 Everyone is finding that their skills are getting better and better each time they practice, and those who can make the smooth cuts are having less sanding to complete. I recently purchased a used Panasonic Toughbook CF-30 laptop and it is the best computer I have ever used. They really are one rugged laptop used by contractors, law enforcement, boarder patrol, etc.... Go to you tube and watch how it can withstand dirt, water, and fire... and even being driven over with a car. A friend of mine picked some of these up at auction. They may be a little older, but they are still superior to anything I've ever used. 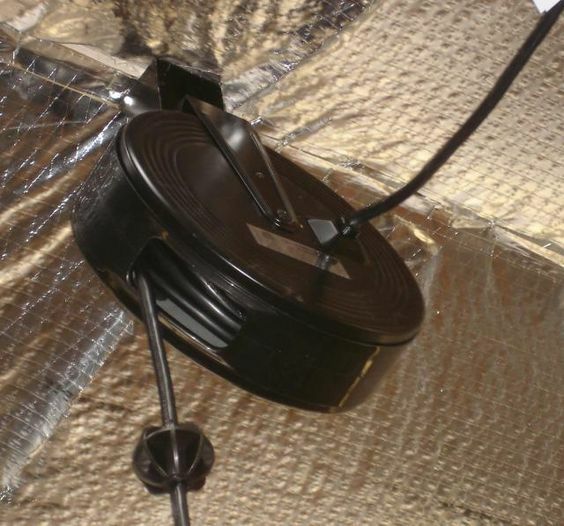 To save energy and make the battery last longer in the field, they don't have a cooling fan. Besides, a vent might let in dust and moisture too. My wife also got one and quickly noticed that it got a little hot on her lap. She resorted to using a layer of newspaper as a heat block. As for me, I was playing movies over netflix when I actually over heated it because video makes the Duo Core Processor work overtime generating a lot of extra heat. It didn't help matters to have had it sitting directly on a counter top, in the garage (wood shop) with no air circulation under it, at the warmest time of the day and year around here. That gave me today's challenge.... design a simple (passive) way to circulate air around a home laptop computer. I believe something like this could be a good challenge for students at the high school level too and you could easily find ways to have students improve and revise their prototype design creating several generations of product. They could also produce a customer survey. The Toughbook CF-30 shop made cooling pad 1st generation. 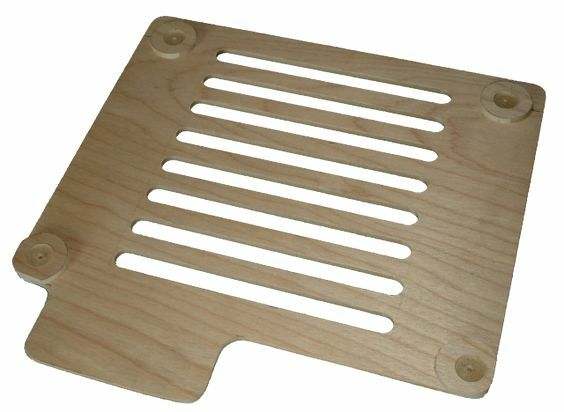 Made from 1/4" veneered MDF, the top is cut away to allow air to touch the bottom of the computers case. 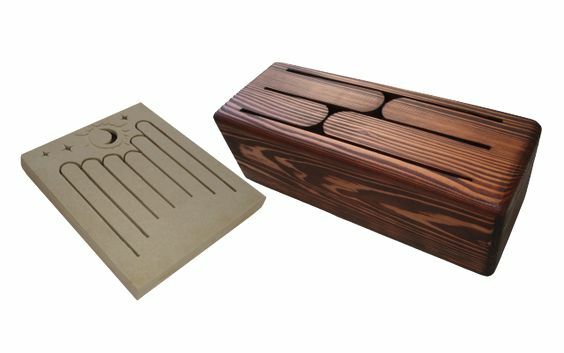 It is light weight and has only 1/2" space between the top and bottom making it a total of one inch thick. The computers rubber feet fit into the drilled indents keeping the computer from slipping or sliding off. The metal piece at the front deflects sound from the speakers up towards the user. The metal at the back holds the cord. As I was testing it, I immediately noticed that it really works well (hardly even warming up now), a remarkable difference. Even though this cooling pad works beyond expectations, my wife challenged me to reduce the overall thickness and weight. Instead of the double layer, I came up with a single layer that is less than half the thickness and weight. It seems to work about the same in every way, and I'm totally amazed that such a thin layer of air can make so much difference. I'm planning to add rubber feet to allow more air circulation when it is set down on a table since she needs to do this when sketching out new artistic ideas. 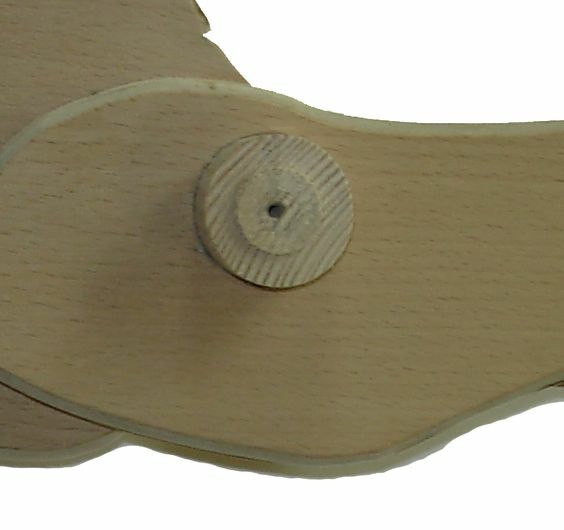 Rubber feet will also add a non-slip grip to the bottom. The improved Toughbook CF-30 shop made cooling pad 2nd generation. I'm seriously considering showing my 8th graders this example 2nd semester and then have them work together to design an actual product. Teachers here start back Monday. Today I made the template for a welcome sign. Perhaps it's for welcoming students back, but actually I believe many students will want to make this for mom. To make the over sized fat lettering, I added about 1/16" when I traced around this pattern. I'm also thinking of making a template of the alphabet with easy to trace and cut lettering so that students can make their own names for their bedroom wall. ***UPDATE*** Although the welcome sign has not been a huge hit, the idea has been. Several students are doing signs for baseball, etc... 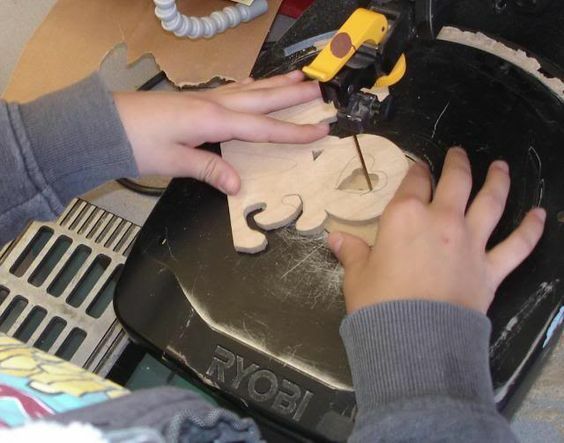 It is mostly the younger students that are finding it challenging to cut smoothly on the lines with the scroll saw. I know this early practice on 1/4" material will improve their ability to make these cuts as they come back again and again each year to make the more complicated projects. This reminds me, before common core became popular, Bob Itnyre was participating in the woodworking curriculum consortium. In fact, he was one of the first to sign on and was recently updated. Bob can tell anyone who asks, just how far the project came in a short time. Anyway, after learning more about common core and what some of you are suffering through trying to align to it, I would have to say, it would best be ignored (if possible). I know some of you are being forced into it and that's a shame. It takes away our freedom to be a great teacher. 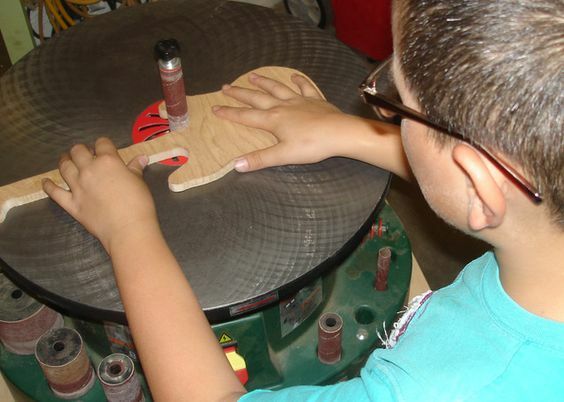 If it were up to me, I would say that we should keep teaching hands-on, because it is a far superior method and keeps students engaged better than any other subject in school. Here is an example of a math related PowerPoint I made before common core was popular and it is in fact contrary to what appears to be the goals of common core. From what I've seen of common core, I think that I actually have it backwards in their perspective and should not be using simple equations. And to think I got the idea for making math PowerPoint's from an electronics instructor who kept reminding me how much easier straight forward math can be. In business, time is money and we don't have time to dilly dally around making things more complicated. My point for showing the PowerPoint to my students (many of whom hated the academic classes) was to prove that more complicated wasn't a good way to keep your bid less than the competitors. Simple equations speed things up keeping labor costs to a minimum. Who would you rather hire, the guy who goes the long way around every time or the guy who gets it done in one tenth the time. I have been continually updating older posts if you care to go back to some of your favorites, and I will continue to update periodically so check back to see how well these projects work out. I've also told the students that with parent permission, their photo of them working on their project could potentially be posted here.... or if their face isn't clearly shown, it can be posted without permission like these. The students did a rubbing of the top of my sample so they could transfer it onto their wood. 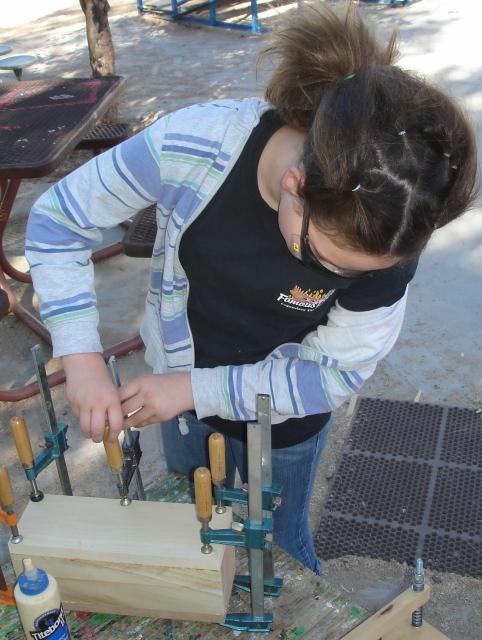 Samantha glues together her slot drum. She's so excited to get this project together that she came from another class to do this on crazy hair day. There really was some crazy hair that day. Samantha only looks a little different because of it, but some of the students went all out and I should have posted a few just to prove how crazy some of them were. The drum project has been a huge success for those who have attempted it, but solid wood has been more difficult to obtain and limits how many can do this project. If someone asks and we don't have the material at the time, it's not going to happen, but when the material comes in... try to remember who was interested... for get about it. 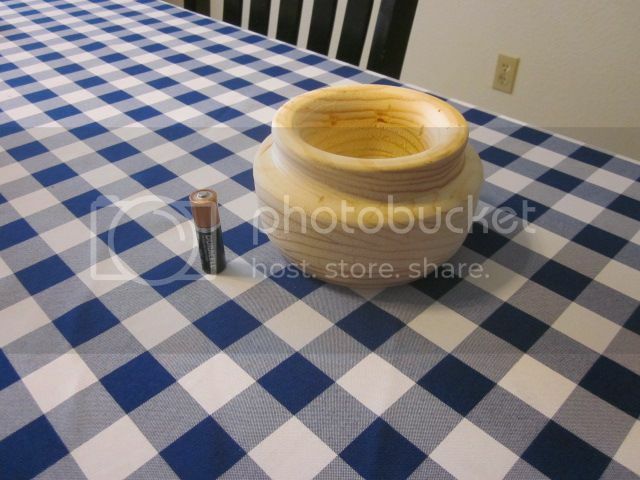 ***UPDATE*** 10-22-15 This young lady is so excited to have finally completed her slot drum. ***UPDATE*** 10-8-16 The slot drum is a favorite project and we have added the finger joint corners. 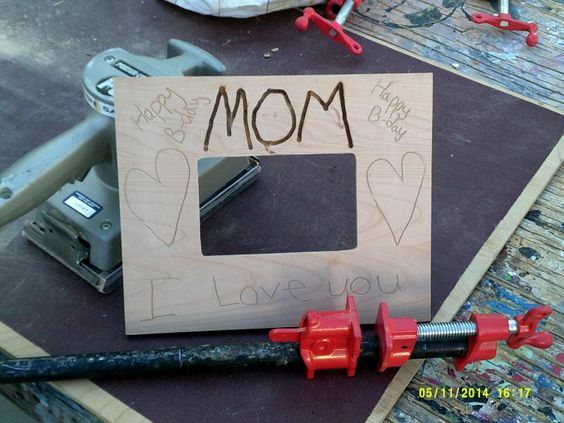 Top... After school program 4th graders using the router to decorate their picture frame, (below) a priceless treasure for Mother's Day. 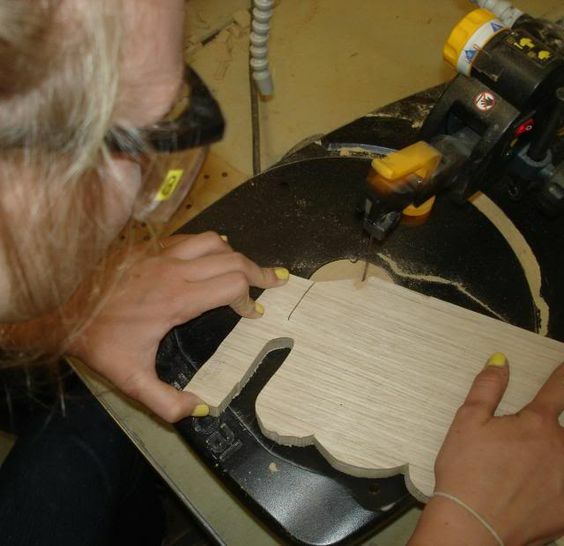 Don't forget to check out my former students cabinet shop website. He was a sophomore in 1981 when I first began at the local high school. Even though we were teacher student then... we are now beginning to look the same age. He is very kind to allow me access to his shop and employees to go through the throw away materials before they get to the dumpster. Everything you have seen in this thread came from that material. 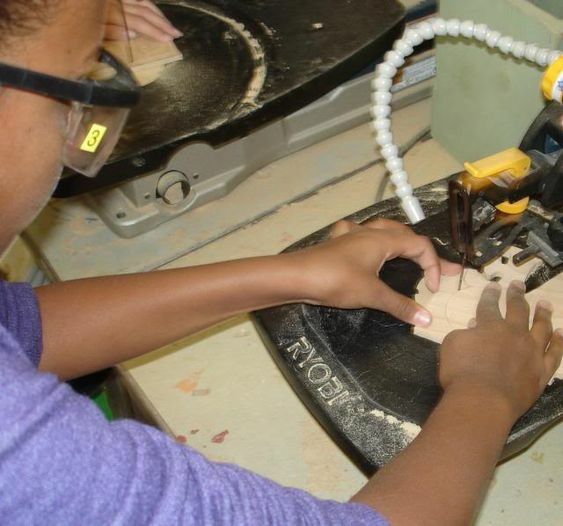 I ran across this photo of a student's goblet that was part of a wood shop display our yearbook teacher made for open house. First, I didn't have to ask to get her to take photos, and then... was surprised that she made a great display out of them for open house (which I didn't even have to attend). I have since used the display to advertise our after school wood shop. When I asked her about this photo, she couldn't find the original, so she scanned a section of the display and sent that to me. I took the scan and turned it into this jpeg. It's kind of too bad that this is the only example I have of the goblets that were made in my class, because if you look closely, this one runs right into the chuck. As I remember, I discussed what to do about it with the student and we were able to salvage it by hand sanding out a base from what was left. I know they must have liked the final result because it is no longer anywhere around here. Our goblets are made from whatever we can find... lately it's cottonwood from a single tree taken down in a students yard. His mom brought it to me on a huge flatbed trailer. Cottonwood is a native "soft" hardwood that is especially well suited for goblets. The Cottonwood's root is what the Hopi tribe uses to carve Kachina dolls. I cut 6" pieces from the trunk. Although it appeared to be completely dry, once it was exposed to the dry Arizona air, it started to shrink and crack overnight. The only way to salvage it before losing it completely was to mark squares and then quickly split it up into dozens of goblet sized blanks. 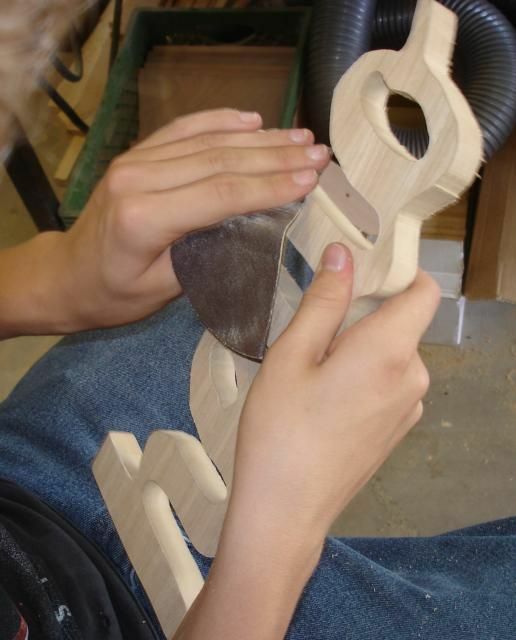 The student below is just beginning to shape the blank so it can be mounted in the chuck. 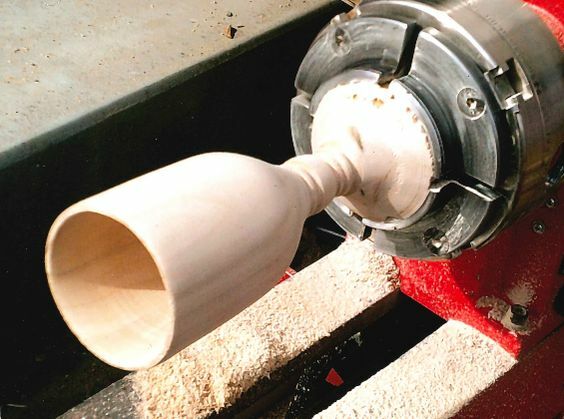 As a cylinder takes shape, the tool rest gets placed closer and the ends are evened out. The chuck end is reduced a little more as small friction ridges are cut to give the chuck a better bite for more holding power. A template (not shown) is used to measure the diameter to keep it within range to fit the chuck. Go too small and you have to start over. We are quickly running out of blanks. 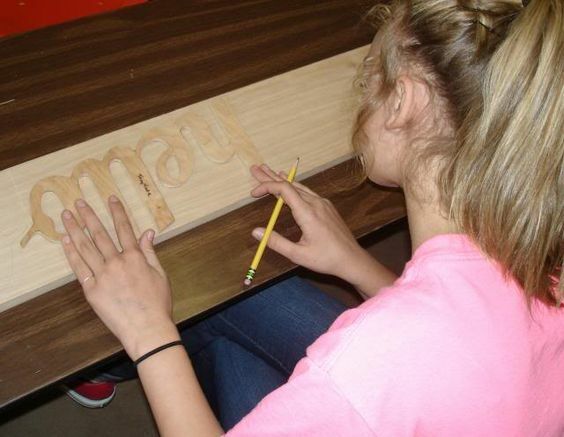 7th grader (new to our school this year) can't get enough woodshop. 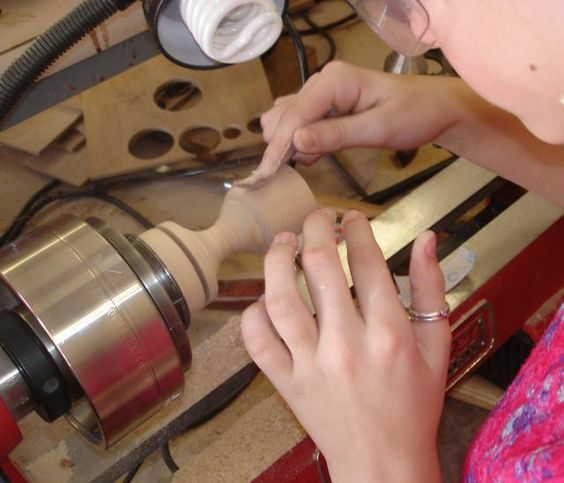 Here she is in the shop before school to finish up a goblet on the lathe. ***UPDATE*** This has become one of the most popular projects. Here is one I really wanted to show because the student figured out how to burn in his own design embellishments. Like a glimpse into the future.... skip to 2016 to see where our wood for goblets eventually comes from. The back arrow will being you back here. The parts spread out so you can see... tenons are carved on the ends of the (solid wood) wings (like dowels) and put into a square (3/4" x 3/4" x 1 3/4") block. 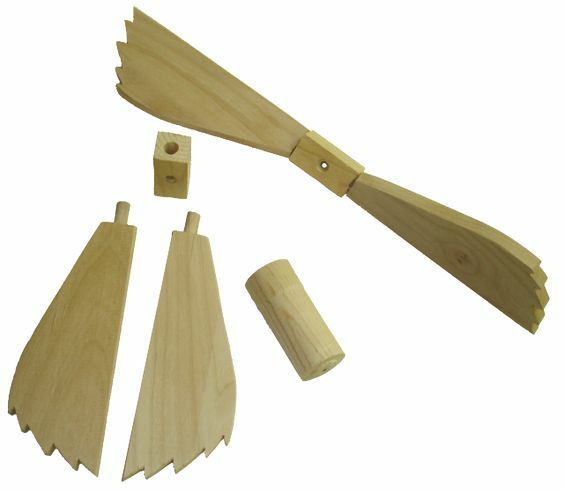 This allows an inexperienced student to easily make the propeller shaped wing which can be fine tuned (change the pitch and balance the sides) for it to spin easier in light breezes once it is screwed on. Download the wing pattern. Close up... The wing assembly is held on the body by a 1 1/4" dowel made on the lathe (snug fit) and put through all three body layers. A reduced area is the size of the washer (which will be placed between the surfaces) to keep the wings spinning smoothly. After the art students painted it white, I gave it to our Principal. Skip back to the first Pegasus post. The back arrow will being you back here. To solve the puzzle, move the entire pyramid (6 or more rings) to another peg one ring at a time, while never placing a large ring over a smaller one. 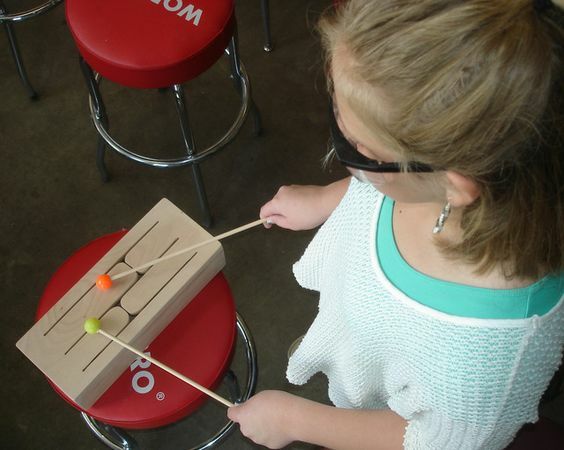 Make it more challenging by choosing which peg the final pyramid will rest... such as the center peg. The first four rings are so easy it gives students a sense of confidence... but each additional layer brings more and more challenge. 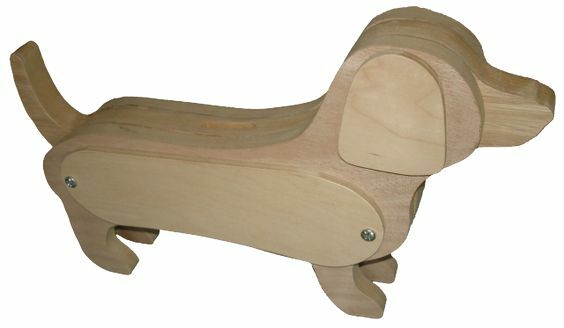 One of the eighth grade girls wanted to make the wiener dog... but as a bank, not book ends. 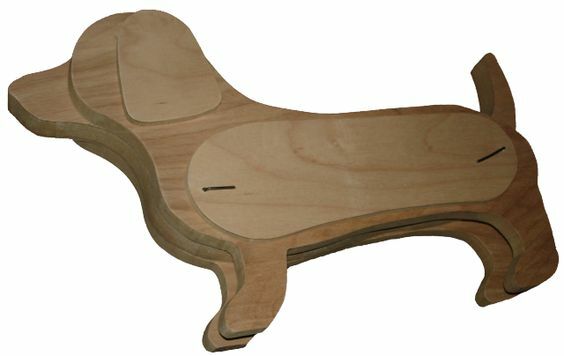 I had her trace out each half of the wiener dog book ends template while placing them back together so they would form the whole dog. She did a really nice job of tracing and cutting. All the students always ask about the small holes in the templates. They are registration holes used for three purposes. First, they provide a way to wire (group) the templates together so they don't get lost when not in use. Second, they allow bailing wire to pass through to hold and keep the pieces from sliding when checking fit and also during gluing. And finally, they are the screw holes that keep the sides in place. Here is the prototype we have put together... currently being held by two pieces of wire passing through the registration holes. Since it's not glued yet, there is still a way to adjust the parts. I'm literally turning kids away... there simply is not enough space or equipment. After school classes are completely overloaded. I open before school and at lunch whenever I can. Here is the finished prototype. I like it the way it is, but I've seen some of these dogs that are on the chunky side. If someone thinks this one is too skinny, another layer could easily be added... like what I did to the elephant bank. I'd make a 1/4" layer like the layer with the legs, but leave off the leg part. That would add another 1/2" to the width. Late October... This project is quickly becoming a favorite and I have not remembered to get out the camera during this project. 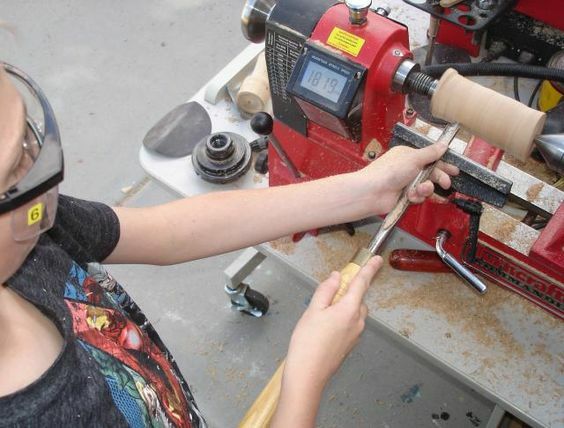 One of my 2nd year students (now 8th grader) bought a Harbor Freight lathe last year. He now has an Etsy shop called SAYPens. I watched several teachers purchase pens that he brought with him today. Last time I looked on the Etsy site, his pens had all been sold. Keep up the good work Seth! 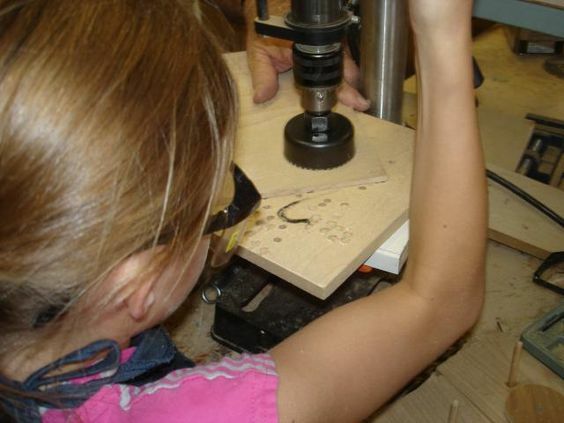 I like seeing kids learn about starting their own (woodworking) business and then I found this on Yahoo news... a newscast from CBS about a successful 8 year old girl, now 14. The only thing I would add is "hair tie" and "safety glasses"... on the drill press and yes, even with the lathe off when you are sanding. 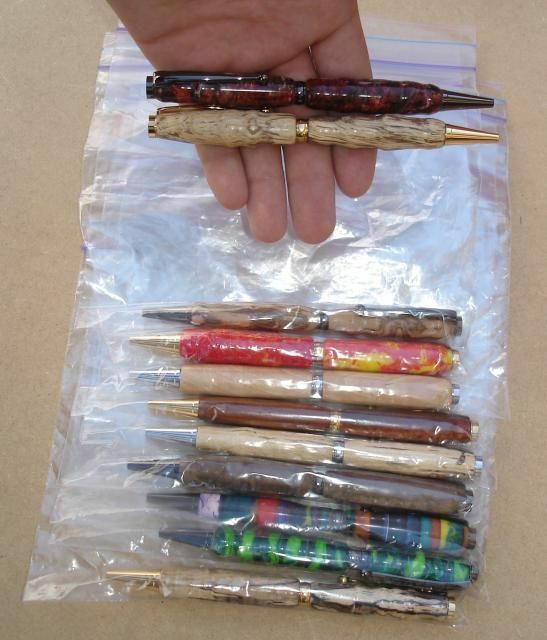 WOW... What a good job... selling hand made pens made from "historic wood" for $50 to $750. The mother of one of my 7th grade students told me about a poem her daughter wrote to share with her family. She said I should ask her daughter if I could read it, so I did. They gave their permission to share it and I thought you might like seeing it too. If you have my General Safety PowerPoint you may recognize where she clearly hits many of the messages from the slides, but it took me a little while to figure out some of it. WOOD SHOP POEM by Name withheld. The dust is making me cough! With a shrill cry we knew she'd hit home. How many band-aids does the school nurse bring? She will no longer have need of a comb! My wrist now has a sprain! Because his right is an end! 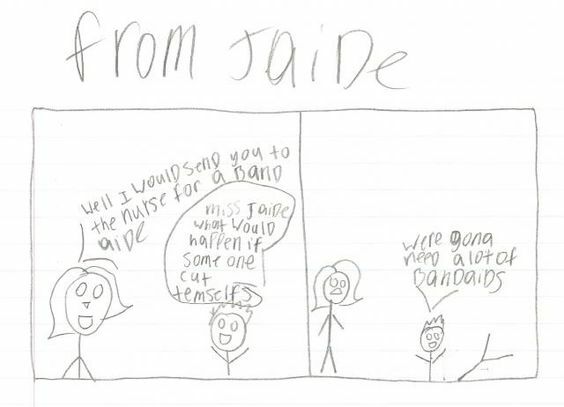 I found out by accident that one of my students is a budding cartoonist. 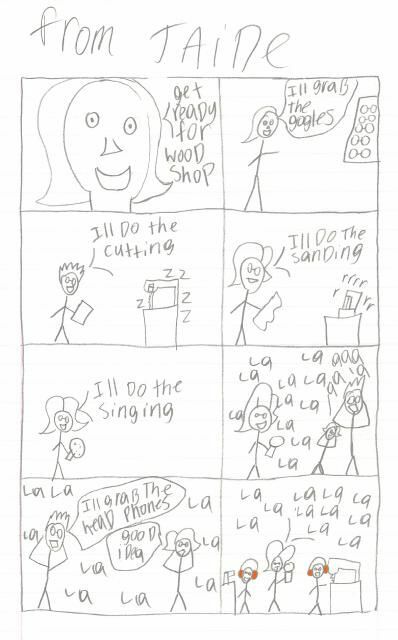 She has a talent for incorporating humor into any situation, so I asked her if she ever considered making a cartoon centered around wood shop. It would stand to reason at this school that music would become one of the topics. I hear singing around me all the time. Since I began at this school about a year and a half ago, I can't think of more than one accident serious enough to require a band aide. It involved a chisel and dried glue... ouch! The band aide disappeared by the following day making it seem only like a slight accident, but then it's the humor that counts on this next one. 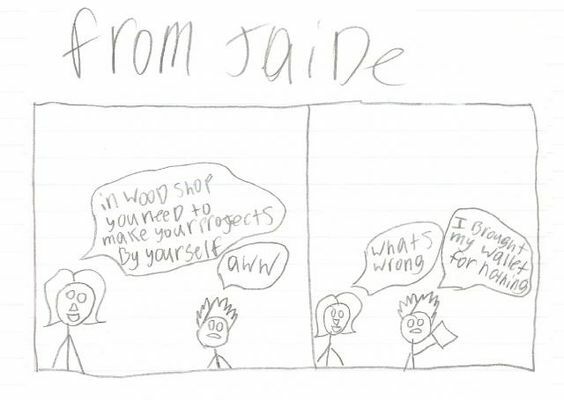 I have to say when I saw this next one, it made me think about how many times the students have tried to talk me into selling them one of my prototypes.... Hahaha! Either someone has moved it, or it was put in a place so safe that I'm having trouble finding it. Is it here at the school or did I take it home? It's been months since I needed it. 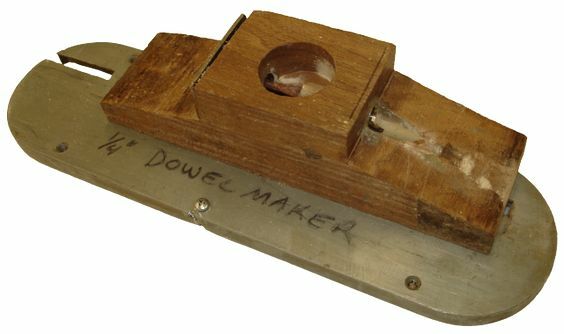 Either way, the second problem with this version dowel maker is how it ties up the table saw, but the results are terrific, smooth dowels that work so well in our projects. None of that matters when you can't even find it. ***UPDATE*** While clearing out the old shop and moving to the new shop, there it was.... right under some other stuff, on an over crowded shelf. Since I was quickly running out of 1/4" dowels, I took a little time before classes to make one for the router. 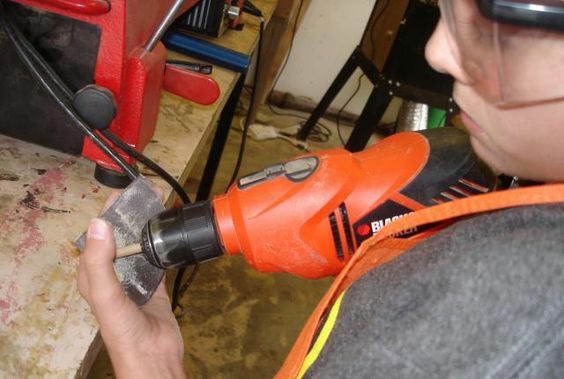 Routers can be found at yard sales around here for $5, and having an extra router that can be dedicated to the task is a cool way to solve the problem of cheap, quick and easy to make dowels. This is a block of ash with a sleeve made from an old discarded school chair I found in the dumpster. The sleeve was drilled out large enough to accept a 5/16" square which will spin through it using a drill. The hole for it stops before the center chamber and a slightly smaller hole continues on. This keeps the sleeve from sliding into the bit. The sleeve has been glued into place with Gorilla glue so it will not travel. The 1/4" sleeve was made from already formed sheet metal from discarded welding booth rails that look like a double tube with a web between them. When cutting a section off for the project, I purposely left half the web attached to the tube. The tube is reamed with 17/64" drill bit so the dowels will easily come through without being too small. After drilling a snug fit (for the sleeve) exit hole through the wooden block, a saber saw was used to make a slot for the web. The extra web keeps the tube from spinning. The snug fit tube (coated with Gorilla glue) was hammered into the block. 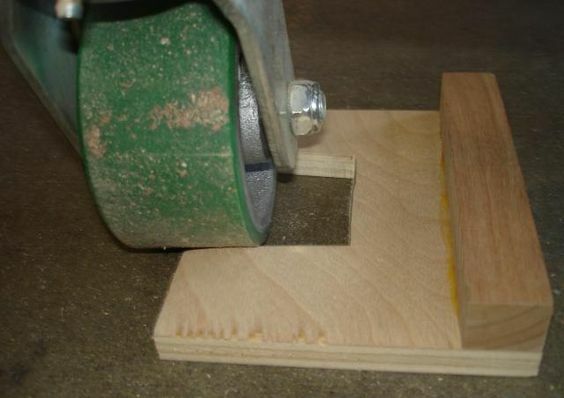 The router base can pivot to fine tune the cut. The router has a straight bit and the spinning material is pushed through the same way as the table saw version. 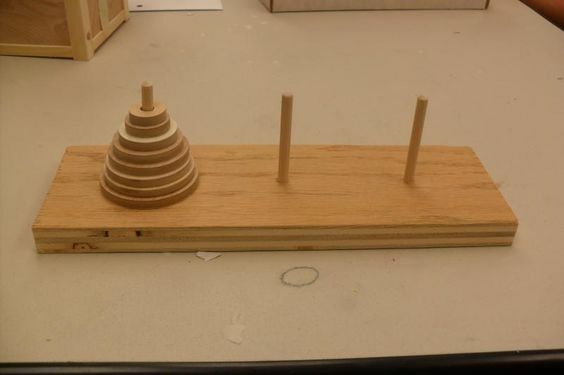 It's already set to run, so it takes less time and is safer, and the students have a choice to use the pre-made dowels, or they make their own. 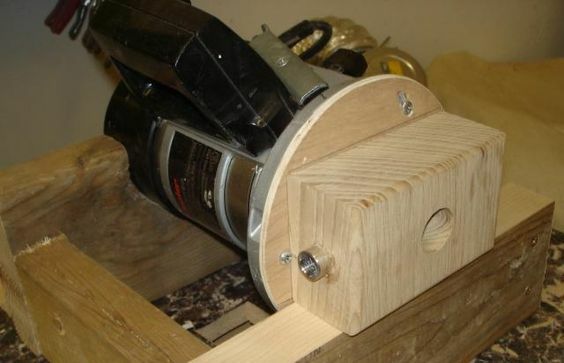 A 2" x 4" cradle holds the router in position when it is clamped onto a table. Hopefully it will never get put away where it can't be found. If I had to estimate how much this trick has saved just since I've been at Franklin Phonetic School, it would easily be over $100 dollars per year. Time invested, a couple of hours. Although in this photo you can't see the coin slot, this is another student initiated (piggy... or in this case dolphin) bank. 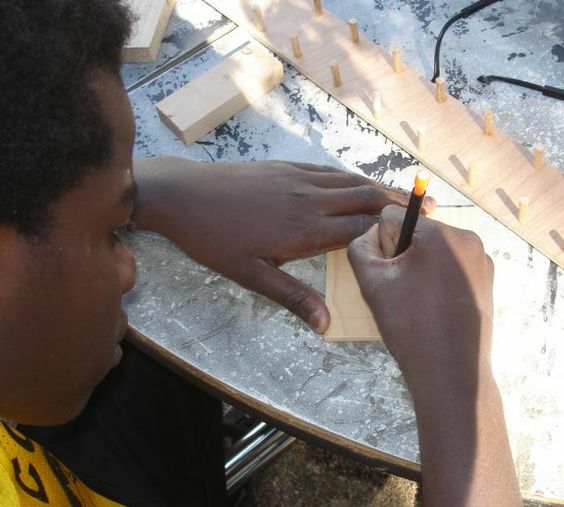 As homework, they found and trace out the silhouette and the next day cut the first templates from 1/4" MDF. Assembly is pretty much the same as all the other banks. The stand was my own after thought which simply displays the bank. I would share the templates, but since they are at the school, I haven't had a chance to check out if they even fit on a scanner. 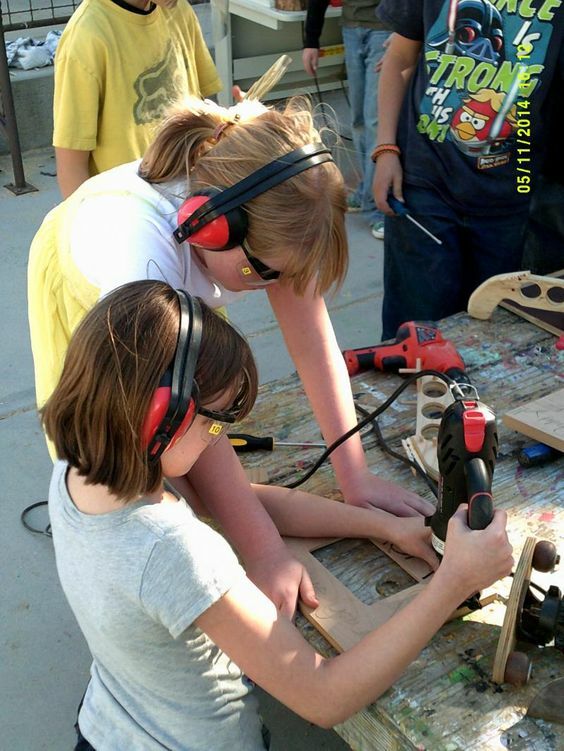 Just about every 4th grader that enters the shop wants their very first project to be the most complicated one. 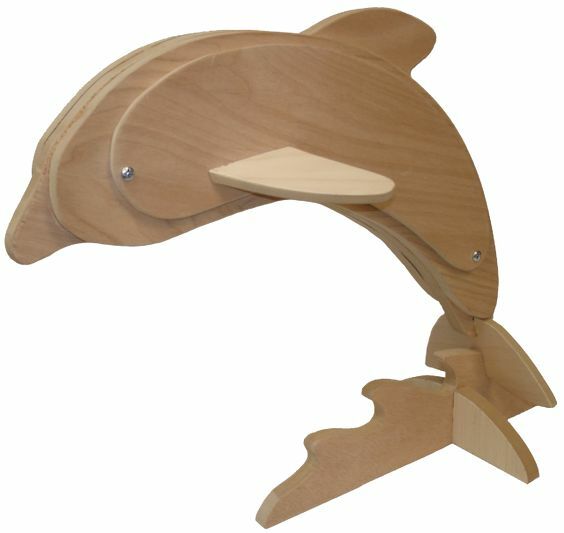 I can't even begin to tell you the look of disappointment when I tell them they have to work up to the dolphin or marble machine (See Marble Machine post on Page 2 Panel 36 of this thread). 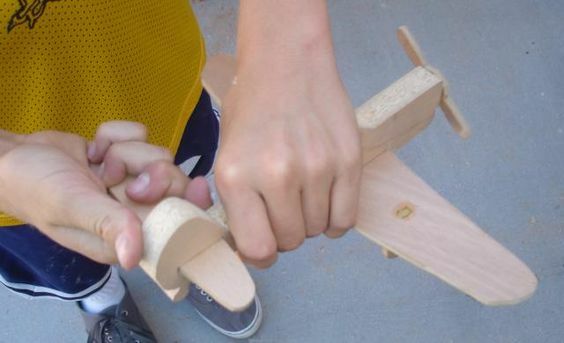 They quickly get over it... once they experience the fun of beginning their first projects. View the update on our new wood shop (Page 2 Panel 27). I will be working a little over Christmas Break to get moved over to the new location. I've often spent my Christmas vacations at school doing extra things and this year it's fixing up a new wood shop space. I'm trying to eliminate dust and debris by eliminating surfaces that catch dust and other junk students tend to leave behind. We are also adding dust collection both for the entire shop and individual machines, something that has taken a while to accomplish on a tight budget. Here is what can be accomplished with little funding. As yet unpainted, this is one answer to our lack of floor space.... a three lathe stand. 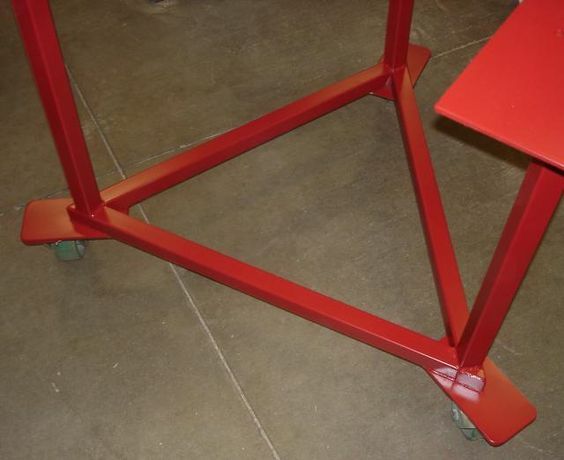 Costing much less to build than buying three single stands, this innovation will allow three students to safely work in a smaller space. 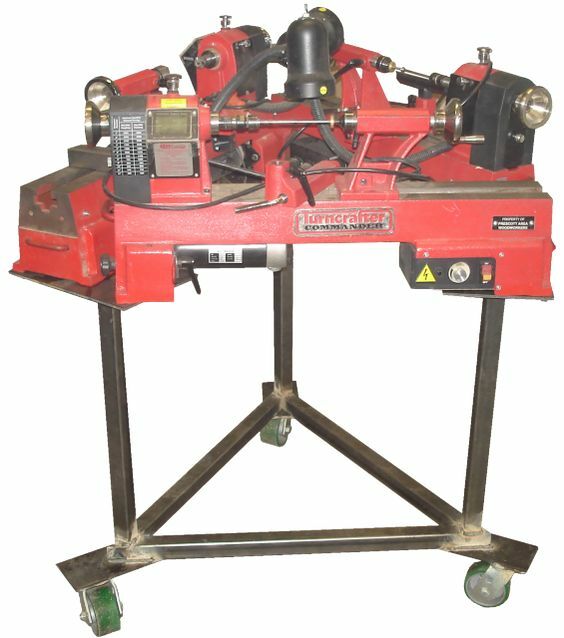 There will be two of these rolling carts and three more lathes will be ordered in the next few weeks thanks to tax credit donations. At my previous job I would bunch up three mini lathes on individual stands. The stands would make it difficult to get them real close and it was difficult to clean around. This new three lathe stand doesn't have surfaces to catch debris. It's almost as if they are floating. Everything should fall to the floor. Two of these lathes were given to us by the Prescott Area Woodturners (as noted by the tags on the right corner to say it is their property in case the program ever closes. The woodturners did this because my previous employer never returned their other lathe when that program was closed down). The third lathe in the picture was purchased through tax credit donations. 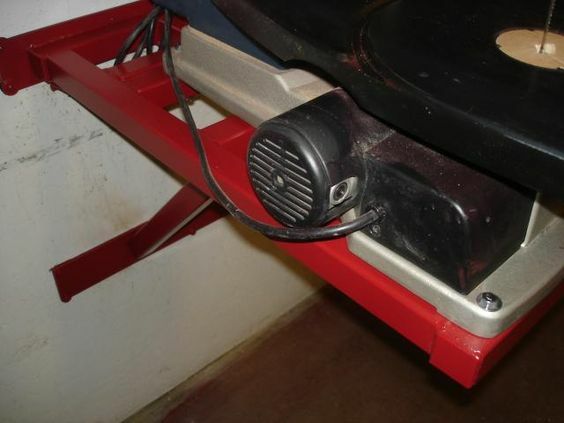 It's easy to remove this simple wheel chock when you want to roll the lathe aside to sweep. 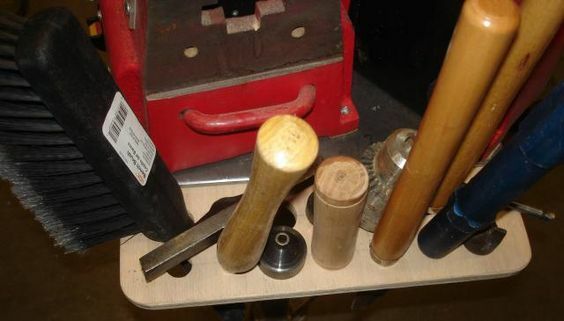 A simple tool holder is now bolted onto each corner. To complete the second half of this project, I will need three more lathes, three more easy to make tool holders and paint. ***UPDATE*** Now cleaned, primed and painted to match the lathes. Now... if only it can stay this nice forever... no chips or scratches... Hahaha! First week of March... Good news, the new lathes arrived and are now installed. 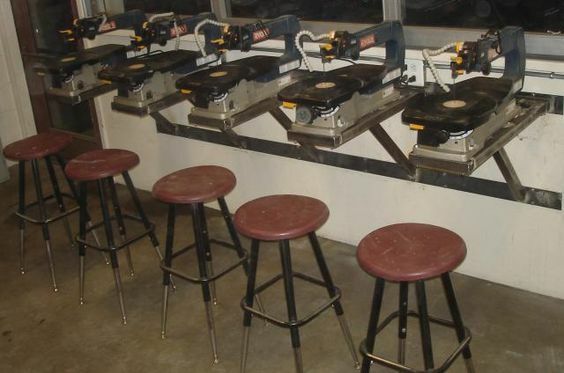 6 lathes doesn't seem like much to most of you, but it is a dream come true here. Unlike the tangled mess we previously had, three drop cords keep the floor clear of excessive extension cords. 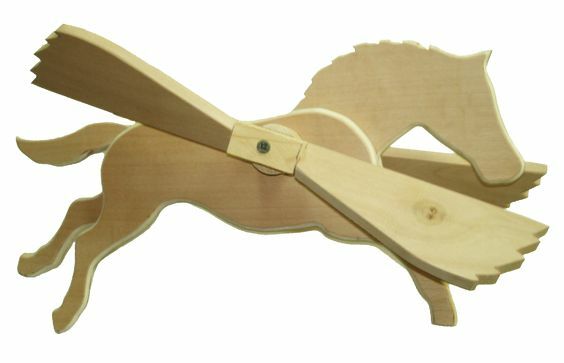 Wall Mounted Fold Down Scroll Saws Save Space. 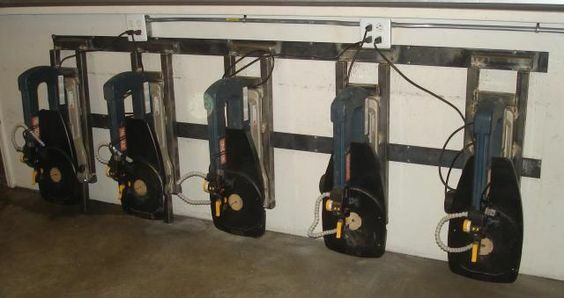 This is another space saving idea... fold down scroll saws. After first making a proof of concept (view the video) out of wood, we built this from square metal tubing. Here they are up and ready for use. There is no table, only an open frame. All small bits of scrap, including the saw dust, falls to the floor. Since they are independent of each other, they can be put up or down randomly (view the video) so some are up for use while other could be down for additional space. After sweeping the floor, folding them down will cause everything that might still be on them to also fall to the floor. No place for anything to collect and build up. Look how much floor space there is when these aren't in use. All that is left on this project is paint. There is enough space under the other window for another set of five should we be so lucky. Here is what they look like after paint. There are three sets of these wall shelves to hold everything imaginable (including student projects on some of the low lying shelves). A 10 foot step ladder allows me sole access to the higher up shelves. 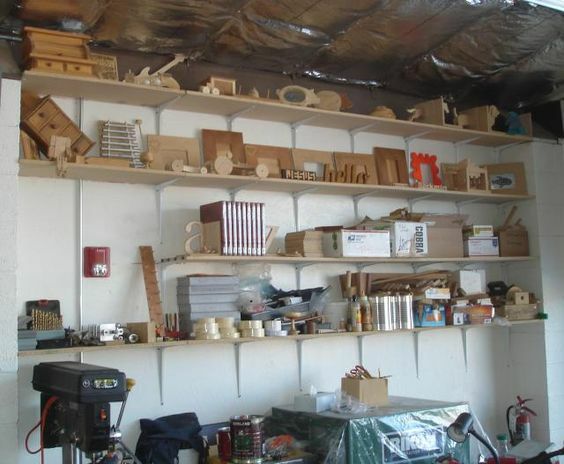 In this section there are about half of the project prototypes on the top two shelves. To the left (out of the photo) are the other half of the prototypes. The left set of shelves also contains all the templates on the lowest shelf for easy student access. The space is climate controlled. The large windows are really roll up doors which can be opened when the weather is warm, and up or down, provide an ample amount of natural light. To compare this new space to the old, see page 2 at the bottom of panel 27. When I tell people it will take several months to complete the new shop space, they look at me like I'm from another planet. Short cut to page 4. Skip directly to shop space part 2.